【Native Resolution】 : 800 x 480 pixels , support 1080P HD to make it clearer. 2500 lumens with 1000:1 contrast ratio brightness for clear, razor-sharp images. 【Large Screen Experience】 : Manual focus adjusting get picture maximum up to 100 inches, projection distance : 0.9 -3 meters, the best projection distance : 2-2.5 meters. Picture switch from 16:9 and 4:3 to meet your different demands. 【Multi-Connections】 : Various multimedia ports AV, DC, Earphone, HDMI, TF Card Slot ,USB, VGA and it is compatible with Sony PS4,Xbox. 【LED lamp lifetime】 : over 30,000 hours long life time with LED Light source, no need to replace it. Built-in high fidelity 8 ohm 2W speaker. Enjoy it at home just like in big cinema. 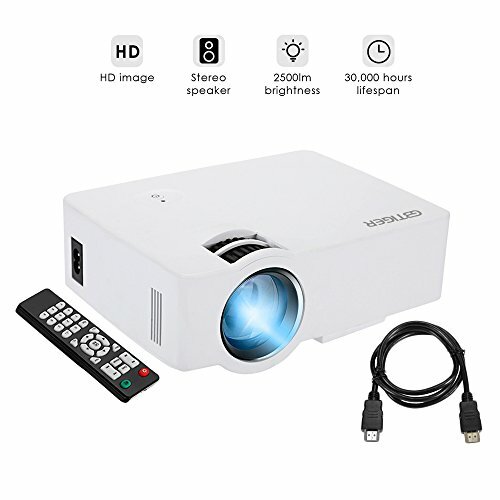 【Support professional customer service】 : Any other problems with the home projector,please feel free contact us, we will reply you within 24 hours. If you have any questions about this product by GBTIGER, contact us by completing and submitting the form below. If you are looking for a specif part number, please include it with your message.